As a third-grade teacher, my job is to get my students excited about science, understand basic concepts, and feel confident that they could one day become scientists. In my experience, one of the best ways to increase my students’ enthusiasm for science is to have a real-life scientist visit my classroom. Luckily, I’ve got a pretty close connection with such a person. My dad, Dr. Bill Dower, has his Ph.D. in chemistry. Though he is now retired, he spent 32 years working for 3M in Minnesota, Italy, and Texas. He is the inventor on 35 patents related to imaging, displays, optics, laser processing, optical fibers, telecommunication, adhesives, and sealants. He also developed new products for corporate customers. To show my students how he used science in his job, he brings in examples of his work to share. The AACT Science Coaches program has been a perfect opportunity for me to work with my dad to provide exciting science learning experiences for my students. He comes to visit my classroom, and my school receives grant money from ACS for our participation in the program. When we first started this partnership, our goal was very simple: Find an activity that was based on the curriculum and present it to the kids. Now we’re in our sixth year of the partnership, and have succeeded not only at getting the students excited about science, but also increasing their understanding of the topics I’m teaching. We would like to share some tips that we’ve learned based on our experience during the past six years, so that you too can benefit from a similar experience. What is the main idea that you would like students to understand during the experiment or demonstration that the scientist will lead? Use that as your main focus, and plan all discussions and activities to support that idea. Share with your scientist the various vocabulary words you want them to repeat and explain. Also, think of one sentence that you’d like the kids to understand after the visit with your scientist. Share that goal with the visiting scientist so s/he can keep that clear objective in mind. I always put an anchor chart of vocabulary words in the front of the classroom. This helps my students (and my scientist) remember what words we are expected to use. For example, one of my objectives was for my students to understand that a gas in a container takes up the whole space within the container, but a solid keeps its shape. To do a demonstration that he called “Air so cold it is boiling,” Dr. Dower came to my classroom with a tank of liquid nitrogen. He blew up a light-colored balloon by mouth, and the kiddos watched the air from his lungs fill the whole balloon. After tying off the balloon, he set it in an empty ice bucket, and then he asked the students what would happen if he poured liquid nitrogen over the balloon. The most common answer was, “POP!” (During this part of the demonstration, Dr. Dower engaged the students in a discussion about safety to be sure nobody touched the liquid, and to highlight the importance of lab coats, gloves, tongs, and safety glasses.) He poured liquid nitrogen over the balloon and students watched in awe as it deflated and disappeared into the ice bucket. When he held it up for the kids, he pointed out the white crystals of ice water and solid carbon dioxide inside the balloon. The class watched it re-inflate as the liquid returned to the gas state. 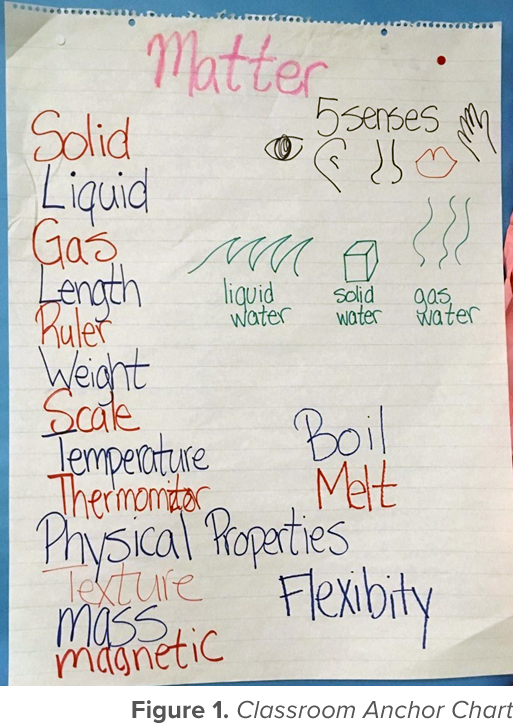 The visual helped them understand the differences between states of matter and the changes between them. Dr. Dower did another activity focused on matter, but this one concentrated on movement. He instructed the students to sit at their desks; they could move in their seats, but had to remain seated. By following these rules, they would always keep the same neighbors, just like the particles in a solid. Then he had the kids stand up and get closer together. Next he instructed them to move around, not always keeping the same neighbors, just like the particles of a liquid. He then ‘poured’ the students — first into one corner of the classroom, and then another. This demonstrated that liquids will take the shape of their container, but may not fill the entire volume of the container. Lastly, the students ran around on the playground, moving as far from the others as they wanted. They expanded to fill up the whole playground, like particles of a gas expand to fill their container. These engaging experiences really helped my students understand science and retain the knowledge. White glue, food coloring, and borax are useful to teach diffusion when the food coloring is added to the white glue. Additional topics such as bonding, polymers, and plastics can be addressed when the borax is added. Plastic pipe, hammers, and pieces of wood can be used to demonstrate levers and simple machines. Candles are helpful when investigating solids, liquids, gases, flames, energy, light, and heat. Water, bottles, and laser pointers can be used to explore energy, light, refraction, and optical fibers for telecommunication. Sand, potting soil, clay, and cement are great for explaining soil formation and what plants need to survive. Milk, food coloring, and dish soap can help you teach about surface tension, diffusion, and liquids. Use the AACT Colorful Milk demonstration! Dr. Dower is used to speaking to people who have spent eight years in higher education. My students have only been on the planet for eight years! The first few years of working together, I found myself jumping in a lot to say, “Another way to say that would be ...” Sometimes he would go into “lecture mode” and, since my students have short attention spans, I would have to interject and say, “Now, tell your neighbor what you think will happen next,” to ensure that they were following along and engaged. Dr. Dower is the expert in science, and I am the expert in teaching. Before we started, we agreed that this team-teaching style would be the most effective plan for carrying out a lesson together. It is a clear expectation that I will watch for places where it would help for me to jump in and bring it down to the students’ level. Before Dr. Dower comes in for a lesson, we plan over the phone and via email. I also email him a list of vocabulary words and the standards for my grade level. The visit is just the beginning! After Dr. Dower leaves my classroom, my students write about their experience. The main idea for the writing assignment is connected to the one-sentence learning objective that was identified at the beginning of the visit. When my students learned about levers, the sentence I chose was, “Using a simple machine, like a lever, can change the location of an object.” Students had an anchor chart of words to use with our vocabulary words listed on it, so they knew to include words such as: pull, force, fulcrum, work, and location. I use a rubric that awards additional points for the more related vocabulary words that are used and explained. If the science guest will be returning to your classroom in the future, make sure s/he is interested in improving to maximize the experience for your students. Make sure to dedicate some time after the visit to reflect on and discuss the experience with the guest. What went well, and what should be done differently next time? When I taught second grade, there was one particular lesson presented by Dr. Dower that went way over their heads. When he left, I saw many confused faces in my classroom. I asked what they learned and all they could tell me was that the science experience was cool. That was when we realized how valuable it is to repeat the vocabulary words and main idea during the lesson itself! 6. Use your scientist creatively! Dr. Dower has actually become a male role model for many of my students. After his visits, I look carefully to see which students made a strong connection with him. I will often encourage those students by exclaiming, “Oh wow, look at that. I’ll need to tell Dr. Dower about this!” I have also given Dr. Dower copies of assessments and asked for his opinion on the best way to demonstrate particular concepts. When I know that an experiment might get crazy, I invite Dr. Dower to be another set of eyes and hands. We are then able to separate the class into two groups and give them more opportunities to interact with the materials. Remember that the ultimate goal is just to have the kids excited about learning science. If your students didn’t completely understand the purpose of the experiment, or it made a huge mess and didn’t go according to plan, it’s all right! 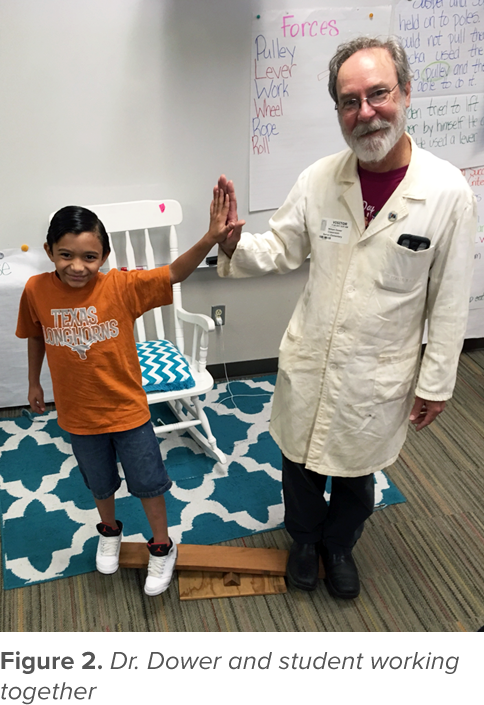 The value of having a scientist present is that it brings real-life experience into the classroom, and there’s nothing more exciting than a person in an actual lab coat during a science lesson. Accept the imperfections and remember that just having a scientist in the classroom gives the students a gift they wouldn’t otherwise have. For my students, it has given them an opportunity to interact with a real-life scientist, and we’ve used the grant money to buy neat classroom supplies. I encourage you to learn more about the Science Coaches program, and to consider applying to be part of it next year! Jennifer Dower graduated from the University of Texas in 2012 and has been teaching ever since. She currently teaches third grade at Ruth Barron Elementary School, in Pflugerville, Texas. For more about Dower’s classroom, follow her classroom blog. Bill Dower, Ph.D. is an alumnus of both UC Berkeley and the Cal Tech. He worked at 3M for over three decades. He now spends his time volunteering and playing music.